The method to go into the flying stage and the signs of a charitable soul. Today, the Father, the Master of the Garden, is seeing in His spiritual garden His fragrant flowers and the buds of tomorrow who are instruments especially for benefit and who are also filled with courage and enthusiasm. Baba is seeing the little children who are the images of the fortune of tomorrow. (Today, a group of little children is sitting in front of BapDada.) BapDada calls these little children the sparkling stars of the earth. These lucky stars will be the instruments to give light to the world. Seeing all these young and old children, BapDada remembers the scene at the beginning of establishment, when such little children emerged and had the determined thought and the zeal and enthusiasm for the task of world benefit: We little children will carry out the biggest task that all the politicians, leaders of religion and scientists want to accomplish, but are unable to do. We little ones will carry out this task and show everyone. Today, Baba is seeing those thoughts of those little children in the corporeal form. Those few little children are today carrying out the task in the form of the Shiv Shakti Pandav Army. All of you know the history. Today, all of you have become the deepmala (rosary of lights) through those ignited lamps and have become the garland around the Father's neck. Even now, seeing the young and old children, Baba can see in every child the picture of fortune of tomorrow's world. What do all of you children consider yourselves to be? You are lucky stars, are you not? Today is the day for the children; the older ones are watching from the gallery. BapDada is also happy to see the special children. Each child will give many souls the Father’s introduction and the right to claim the Father’s inheritance. In any case, children are said to be great souls. All of you are true, great souls, that is, pure, elevated souls, are you not? Do you great souls maintain your one determined thought of constantly belonging to the one Father and following the one elevated direction? You have this firm faith, do you not? When you go back to your own places, you are not going to be trapped in anyone's company, are you? The photograph of all of you has been taken here. So, constantly remember your elevated life. Always remember that each one of you children is an instrument for the elevated transformation of all the souls of the world. Do you have the courage to take up such a huge responsibility? Are all of you children going to fulfil your responsibility of service from amrit vela? If you are weak in any respect, put that right from now. Everyone's vision is on all of you. This is why, from amrit vela until night time, all of you have to follow accurately the timetable that you have been given for the life of an easy yogi and an elevated yogi, that is, for an elevated life. Pay attention to this with determination from now on. Do all of you know the qualifications of a yogi? (All the children responded to all of BapDada's questions, saying "Yes".) Do you all know how a yogi sits, how he behaves and what his vision is like? Do you move along in the same way or do you also make a little mischief? All of you are yogi souls, are you not? You children cannot do what the people of the world do. You great souls have to remain such embodiments of peace that, no matter how many great people there are, seeing you souls who are embodiments of peace, people experience peace. Let them not see you as ordinary children, but as unique children. You are unique and special souls. Do you move along in this way? Transform this from now. Today, BapDada has especially come to meet all of you children. Do you understand? Older ones have still come with the children. BapDada is giving special remembrance to all the children who have come. As well as this, all of you know that, according to the present time, BapDada is taking all the children into the flying stage. You do know what the elevated method for the flying stage is, do you not? With the transformation of one word, you can constantly experience the flying stage. What is that one expression? Just, "Everything is Yours! (Tera)" You changed the word “mine” (mera) into “Yours” (Tera). The word "Yours" also makes you belong to Him, and this one word makes you double light for all time. When you say "I am Yours!" the soul is light, and when you say "Everything is Yours", then, too, you become light (no burden). So, just the one word "Yours". By being double light, you easily become those in a flying stage. You have had the practice of saying "mine" over a long period of time. This word "mine" has taken you into many types of spin. This one word. “Mine” has changed and now become “Yours”. This change is not difficult, is it? Remain constantly stable in the true form of this one word. Do you understand what you have to do? The elevated souls who constantly stay lost in love of the One experience the elevated life of the present time and are also making their future elevated and imperishable. Therefore, constantly remember this one word. Do you understand? On the basis of this, you can progress to whatever extent you want and you can also accumulate as many treasures as you want. In any case, in worldly life, well-known souls from a good clan always have the aim in their lives of making donations and performing charity. All of you are from the greatest and the most elevated clan of all. So, what is the aim of the Brahmin souls of the elevated clan, that is, of the souls who are full of all treasures? Constantly to be a great donor. Constantly to be a charitable soul. If you have a thought influenced by any vice, what would that be called? Would that be sin or charity? It would be called sin, would it not? Be one who constantly performs charity for the self too: a charitable soul in thoughts, a charitable soul in words and a charitable soul in deeds. When you have become a charitable soul, there can be no name or trace of any sin. Therefore, remain constantly aware that all of you Brahmin souls are constantly charitable souls. To have elevated feelings and elevated good wishes for any soul is the greatest charity. No matter what any other soul may be like, whether that soul opposes you or is loving to you, the charity of a charitable soul is to transform the soul who opposes you with the charitable treasures of elevated feelings. It is said to be charity to carry out a task of enabling a soul who lacks something to attain that thing. This is charity. When an opposing soul comes in front of you charitable souls, you would always see that soul as a soul who is deprived of the power to tolerate. Then, with your accumulation of charity, good wishes and elevated thoughts, you would co-operate in making that soul attain the power of tolerance. This becomes an act of charity for that soul. A charitable soul constantly considers the self to be a bestower, a child of the Bestower. He remains beyond any desire for temporary attainment from any soul and even beyond taking anything from anyone. Such a soul doesn't have limited desires such as: When this soul gives something, I too will give something. When this one does something, I too will do something. Because of being a child of the Bestower, he would be a charitable soul who gives everyone love, co-operation and power. A charitable soul never has any desire for praise for the charity he performs because, as a charitable soul, he knows that to accept limited praise is to remain deprived of attainment for all time. This is why, in giving, he is always as full as an ocean. A charitable soul would give others the experience of happiness, the Father's love, supersensuous joy and a spiritual life full of bliss with his every word. His every word would be nourishment of happiness. Every deed of a charitable soul would be such that they enable all souls to receive co-operation. On seeing the deeds of this charitable soul, every soul would experience receiving co-operation in constantly flying ahead. Do you understand the qualifications of a charitable soul? So, constantly be such elevated souls, that is, become the practical form of elevated Brahmin life. Be the charitable souls of pure households, for only with the influence of such charitable souls will the name and trace of sin end. Achcha. To the charitable souls who constantly perform charity with their every thought, to those who go into the flying stage by constantly changing one word, to the special souls who, as children of the Bestower, constantly bestow on everyone, BapDada's love, remembrance and namaste. All of you kumars are going to claim the first number, are you not? Is there only one who claims the first number or do many of you? Achcha. Are you those who will come in the first division? Do you know what the speciality is of those who claim the first number? Those who come first are always equal to the Father. Equality brings closeness. Those who are close, that is, those who are going to become equal can come in the first division. So, when will you become equal to the Father? What will you do when the numbers of the rosary of victory are announced? There is no date but the present moment. Is this difficult? What difficulty do you kumars have? You have to eat two chapattis and engage yourself in the Father's service. This is all you have to do, is it not? You would carry out any task just for two chapattis, would you not? You do that, don’t you? That is not with attachment, is it? It doesn't happen simply because you are told to do so. Kumars don't do anything simply by being told; they are free. Therefore, constantly have the aim of becoming equal to the Father. Just as the Father is light, so become double light. When you look at others, you become weak. Therefore, see the Father and follow the Father. Constantly remember this. Constantly keep yourself under the canopy of the Father's protection. Those who stay under the canopy of protection become constant conquerors of Maya. If you don't stay under the canopy of protection, if you are sometimes under it and sometimes away from it, you are defeated. Those who stay under the canopy of protection don’t have to make effort. The rays of all powers automatically make you conquerors of Maya. The awareness of, "The one Father belongs to me in all relationships," makes you a powerful soul. Kumars, now prepare a plan for your life like this, so that everyone would say, "If there are any souls who are free from obstacles, they are here. All of you become destroyers of obstacles; not those who shake, but those who transform the atmosphere. Become those who make the atmosphere powerful. Let the flag of victory be constantly flying. Prepare such a special plan. Where there is unity, success comes easily. However, don't let there be unity in making others fall, but in making others ascend. Aim to be constantly in the flying stage and to take everyone with you. “Kumars” means those who are constantly obedient and faithful. You are those who follow the Father at every step. The Father's virtues are the virtues of the children. The Father's task is the task of the children. The Father's sanskars are the sanskars of the children. This is known as following the Father. You only have to repeat and copy what the Father has done. By copying here, you will receive full marks. There, by copying, your marks are reduced whereas here, by copying, you receive full marks. Therefore, first of all, check that every thought you have is equal to the Father’s. If not, then change it. If it is, then put it into practice. This is such an easy path! You simply have to do what the Father has done. Those who constantly follow the Father in this way remain stable in the stage of a master almighty authority. The Father's inheritance is all powers and all virtues. Therefore, “the Father's heirs” means those who have a right to all powers and all virtues. How can someone who has a right lose that right? If you become careless, Maya will steal them. Maya also finds Brahmin souls to be her best customers. So, she also looks for her chance. You have been her companions for half the cycle and so how would she let go of such companions just like that? It is Maya's duty to come and your duty to be victorious, not to become confused. When a prey comes in front of a hunter, would he become afraid? When Maya comes, be victorious and don't be afraid. Achcha. The instrument servers! By saying ‘instrument’ you easily remember who made you an instrument. Whenever you use the word ‘server’, definitely use the word ‘instrument’ before it. By considering yourself to be an instrument you will automatically be humble and to the extent that you are humble, you will be fruitful. To be humble means to be an embodiment of the fruit. So, do all of you instrument servers continue to move along while considering yourselves to be instruments? Those who consider themselves to be instruments are always light and always embodiments of success. To the extent that you are light, you will definitely be successful. Sometimes there is less service and sometimes more, so you do not feel that to be a burden, do you? You do not get heavy wondering what will happen or how it will happen, do you? “The One who is making everyone move is making you move and I am simply performing the task as an instrument”. This is the speciality of a server. Remain constantly happy with your own efforts and be content in service for only then will those for whom you are instruments be content. Remain constantly content and keep others content: this is your speciality. According to the present time, what is the service of servers? The service of making everyone light. The service of taking everyone into the flying stage. You can only take others into the flying stage when you are light. All your types of burdens have become light and you are the ones who lighten the burdens of others. You have to enable the souls for whom you have become instruments to reach their destination, do you not? You must not let them get stuck or trapped, but you have to become light and make them light. When you become light, you will automatically reach your destination. This is the present service of the servers. Continue to fly and make others fly. Everyone has received a lottery in service. Constantly continue to use this lottery. Let service continue to take place at every breath and at every second. Remain constantly busy in this. Achcha. May you be a master sun of knowledge and spread rays of happiness into the world by becoming an embodiment of happiness. Just as the Father is the Ocean of Knowledge and the Ocean of Happiness, similarly, you also have to become an embodiment of knowledge and an embodiment of happiness. Do not just speak about every virtue, but also experience it. When you have experienced being an embodiment of happiness, rays of happiness will spread into the world from the souls who are embodiments of happiness. 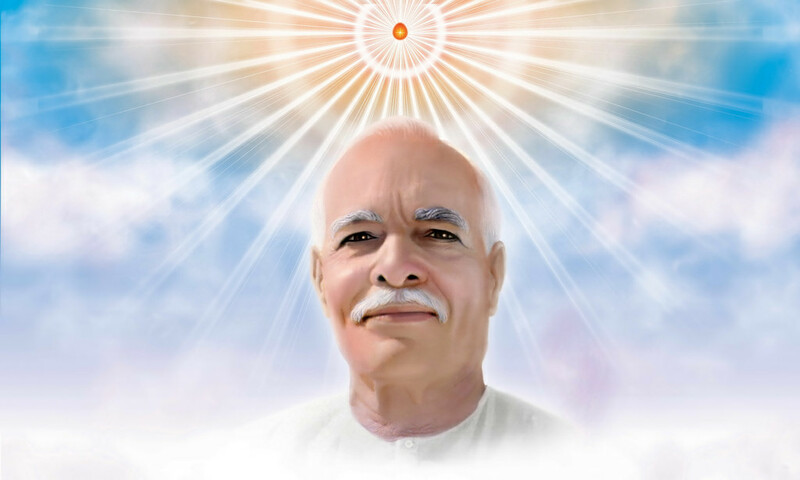 Just as the rays of the sun spread over the whole world, in the same way, when the rays of your knowledge, happiness and bliss reach all souls, you will then be called a master sun of knowledge. Brahmins with a divine birth are those who give the experience of divinity with their words, thoughts and deeds.